The UAE as an enterprising country attracts individuals from around the world, with the vast majority of residents being expatriates. Whilst most expatriates enjoy the attractions of life in the UAE, some of a more nefarious character seek to exploit individuals and companies and then sail off into the sunset, returning to countries where they think they will be safe from the UAE authorities. The UAE, through a series of recent initiatives such as the October 2016 amendments to the Federal Penal Code, are clamping down on criminal activities both within the UAE and abroad. With this more international approach, our clients regularly approach us and request our assistance in locating and extraditing criminals from overseas. We also represent international clients who have been detained and arrested in the UAE and who themselves are sought for extradition. Whilst effecting the return of criminals to face justice is never easy, a solid understanding and appreciation of the international extradition framework and the use of the International Criminal Police Organisation’s (INTERPOL) dispersal and Red Notice systems allows us to better assist our clients and the UAE public authorities in their efforts to pursue justice. 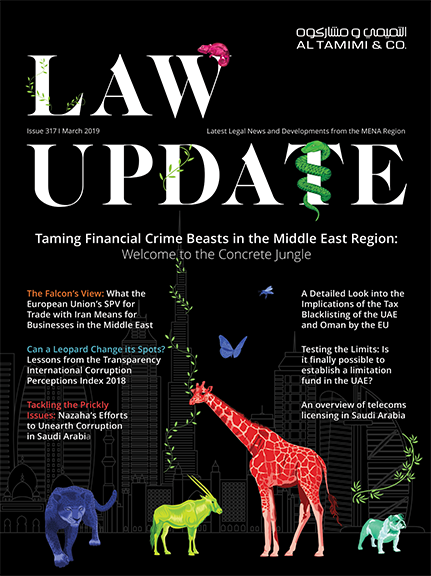 Further to our article in Al Tamimi & Company’s Law Update , ‘Navigating the Minefield of Mutual Judicial Cooperation in Criminal Matters’, which provides an overview of INTERPOL and its initiatives, the following addresses the recent developments in INTERPOL’s procedures and how they may affect our clients in the UAE. In November 2016 INTERPOL, whose headquarters are in Lyon, France, introduced a number of structural reforms aimed at altering the way member states use and approach the Red Notices system when seeking extradition of a fugitive from a foreign jurisdiction. Red Notices are alerts circulated by INTERPOL to all member countries which identify an individual wanted for arrest by another jurisdiction or an international tribunal, seeking his or her extradition. The changes, specifically targeted at strengthening the review procedures once a notice request has been received or circulated, highlight the need for prosecutors to properly prepare criminal cases before submitting the request to the General Secretariat of INTERPOL. First, internal vetting procedures enacted prior to a Red Notice being published have been reinforced. New measures involve the deployment of a dedicated expert ‘task force’; a multidisciplinary team comprising lawyers, policemen and analysts charged with providing support and expertise to the internal review and vetting process. By introducing increased vetting, INTERPOL has raised the bar on requests from states as they now have a greater ability to detect and prevent illegitimate Notices before they reach circulation. Additionally, the capacity of the Commission for the Control of INTERPOL’s Files (CCF) has been strengthened through the creation of an independent Requests Chamber. As per Article 28 of the new statute, which entered into force on 11th March 2017 establishing the CCF, the Request Chamber will now have exclusive power to review all appeals for access to or the correction or deletion of data, including outstanding Red Notices. Not only will members of the Chamber be permitted to make binding decisions over the repeal of notices, but it is intended that the process will also be subject to a greater level of transparency. Limited access to data has previously been a significant barrier to defending against Red Notices in the past and will have important ramifications for anyone attempting to combat spurious extradition requests. In regards to reviewing and appealing the imposition of Red Notices, the newly established expedited timeframes for replying to requests will provide opportunity to those seeking to oppose abusive Red Notices. This is important not only for protecting targeted individuals from illegitimate notices, but also, going forward, for preserving the legitimacy of Red Notices and INTERPOL itself. The immediate consequence of an improved review mechanism is a highlighted awareness of the onus on prosecutors to present a case that is capable of withstanding stronger appeals and to ensure that Red Notice requests are successful. With greater access to the data underpinning each request and with more rigorous standards applied in each review, National Central Bureaus (NCBs) responsible for submitting all requests on behalf of their respective states are opening themselves to a much wider market of potential criticism. Countries that have built a reputation for filing cases that are frequently rejected are more likely to face difficulties as the trend develops, and likewise states that are known to comply with INTERPOL’s standards will likely experience smoother cooperation with recipient jurisdictions. This process of quid pro quo should underline the importance of proper presentation of requests for INTERPOL’s assistance from state authorities and, at a primary level, of the legal representatives of those seeking international assistance. An appreciation of these evolving protocols concerning Red Notices is critical, as this forms a significant part of preparation of cases and subsequently of law enforcement in the UAE. As touched on above, this is particularly important for a country that has both a transient population and well-known profile as an international hub. Due to this international standing, the UAE is well versed in the procedures of INTERPOL and is becoming increasingly involved in the global efforts to combat crime. As part of the country’s 2021 Vision, the UAE has set itself the objective of becoming the safest place in the world, a critical tenet of its efforts to further boost its social and business appeal. In order to better both prevention and prosecution of crime, the UAE will rely heavily on all branches of law enforcement both domestically and abroad. In recognition of this and to further this objective, the UAE government has signalled its commitment to improving international judicial cooperation through a number of different initiatives. In March of this year, the UAE donated $54 million (USD) to INTERPOL’s Foundation For A Safer World, providing resources for key projects aimed at enhancing the organisation’s ability to combat terrorism and organised crime. The UAE has also joined forces with Europol and other cooperating parties in Operation Dragon, a joint action effort that targets organised crime networks operating in crime hotspots. These international ventures highlight long-term efforts to promote judicial cooperation within the region, and are bolstered through the establishment of an INTERPOL style agency between GCC countries, known as GCC-Pol. GCC-Pol is based in Abu Dhabi and currently functions as a law enforcement branch of the GCC, with the intention of providing developed methods of intelligence sharing and operational coordination. INTERPOL and GCC-Pol signed an agreement in November 2016 to establish inter-agency cooperation, signifying the regional agency’s ambition to become an effective tool to enhance the rule of law in the Gulf. At its crux, this principle is enshrined to protect INTERPOL’s neutrality and to shield it from invoking any kind of political liability. This is central to the agency’s ability to maintain its credibility, operate independently and implement a universally acceptable mechanism to track criminals internationally. Furthermore, it is intended to act as a deterrent against the sinister practice of prosecutors pursuing spurious criminal accusations, most commonly perpetrated by states with their own political agenda. As evidenced through the wording of the article itself and by the report that provoked this latest wave of reforms, the article provides little guidance and assistance as a measure to protect against this abuse. As a routine defence, the ‘Predominance Test’ is applied on a case-by-case basis to determine whether political, military, religious or racial arguments form the foundations of a case. The longevity of this issue and its failing defences are indicative of how strengthened measures are necessary to improve INTERPOL’s resilience to abusive practices. Evidently, new cases will be subjected to a much higher standard of scrutiny and need to be prepared accordingly. Meeting the ethical standards of Article 3 will not be sufficient to guarantee the acceptance of a Red Notice request. Intensified examination of cases and wider access to case details confers even greater importance on the preparation of a full criminal complaint. In the UAE, a system is employed whereby local authorities initially issue a local travel ban and subsequently liaise with the National Central Bureau in Abu Dhabi in order to request that they apply for an international arrest warrant. Even if all of the prerequisite information is contained in the file, the success of the request is still contingent on the fulfilment of INTERPOL’s minimum criteria for processing data. Despite the appearance of straightforward standards, Red Notice requests are still subject to a degree of subjectivity in the decision-making process that can make approvals or denials seem arbitrary. Details of previous cases disclosed by investigative reports and INTERPOL’s Repository of Practice on Article 3 expose areas of INTERPOL’s legislation that are ambiguous in their implementation and create significant room for discretion on a case by case basis. The aforementioned Predominance Test, for example, has not been grounded in consistent application of specific evaluation criteria but rather appears to have been subject to the subjective and selective interpretation of facts available to the decision maker. Rather than abandoning Red Notices as a futile exercise, when advising clients lawyers should anticipate such challenges to any international requests and accordingly present their cases in the most convincing manner possible. The UAE has already shown itself to be proactive in INTERPOL’s initiatives and the nation, as the seat for the GCC-Pol, will bear a great responsibility in navigating INTERPOL’s rules and procedures. In today’s global world and specifically with the UAE being a home for many nationalities, those who are victims of international crimes require an effective remedy no matter where the culprit is. If you are going to get your man and bring him to justice, preparation and effective representation are imperative before embarking upon the lengthy road to international extradition.